Standing as a sanctuary for relaxation completed with enormous villas, the Banyan Tree Ungasan is a perfect clifftop property overlooking The Indian Ocean. Boosting of the regal Indonesian touch, Banyan Tree Ungasan serves as an elixir to break away from the tensions of the hectic lifestyle. Rejuvenate in the with flawless Balinese treatments that unify in perfect harmony with modern techniques. Packed with a kid’s club, an elegant spa and an enormous infinity pool. 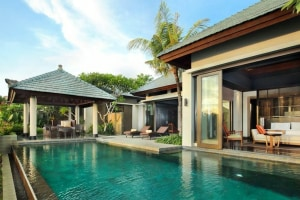 Each villa offers their own infinity pool and spa at the edge of The Indian Ocean. 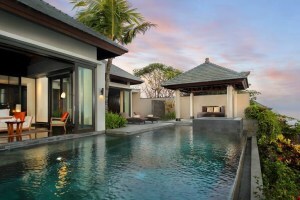 Dwell in this all-pool villa hotel as you escape and revive for that perfect retreat. The afternoon tea is served from 3:30 PM to 5:00 PM everyday. True artistry of Balinese tradition and international cuisines blend in harmony at the Bambu Restaurant. It is well equipped with dedicated sushi counters, grill stations and barbeque pits to satiate all your carvings. So, dine at a casual setting as the atmosphere gets filled with live entertainment and performances. Sunbath as you soak in the sun at the Pool bar with all-day light snacks and drink. Relax in the sun or sip your thirst-quenching cocktails as you watch the sunset transform Bali sky with different colours. Sprinkled with different flavours of Bali, feast on the freshly prepared dishes made from locally sourced ingredients. Enclosed with a tranquil setting, the Tamarind creates a mesmerising Balinese narrative with the use of modern techniques and authentic herbs. Dwell in the trace of tranquillity and relaxation with Banyan Tree Spa that stands as a badge of honour to the ancient Indonesian remedies. It features signature treatments that focus on a holistic wellbeing to detox and feel revived. Your journey towards complete restfulness begins as you enter the spa pavilions and awaken your senses like never before. We recommend you reach the spa fifteen minutes prior for your spa consultation. This clifftop and beachfront property sit at the doorstep of the famous Uluwatu Temple. However, the beach is accessible through a long flight of stairs so, be ready for a lot of walking. 0-12 years can use existing bed free of charge. 0-3 years can use crib/cot free of charge.